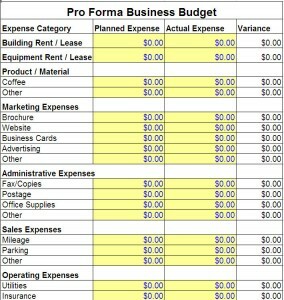 If you run a small business, use this Pro Forma Business Budget Template to keep track of your budget. There are separate columns for planned and actual expenses, with rows for keeping track of rent, materials, marketing, administrative, sales, and operating expenses as well as salary income. You also have a variance column to compare the difference between the planned expenses and the actual expenses, to help you understand where you might be overspending. This template was downloaded from Excel 2007 using the Office Button and Selecting New. When starting or running a small business, following a budget is important to the success of your business. You need to plan every expenditure carefully. This small business budget template will help you keep track of your finances in one easy-to-read Excel spreadsheet. No need to sort through tons of paperwork to find out about your budget—simply check this handy small business budget spreadsheet. This small business budget template will help you launch your business and monitor its finances closely, so you’re never caught off-guard by expenses. Do you love this template? Share it with your friends on Facebook, Twitter and Google Plus! We have other great templates for small businesses as well, so check out the rest of our site. Additional excel templates can be found here. for my Graduate School work.